The US labor market has recently been faced with two distinct and opposing trends. 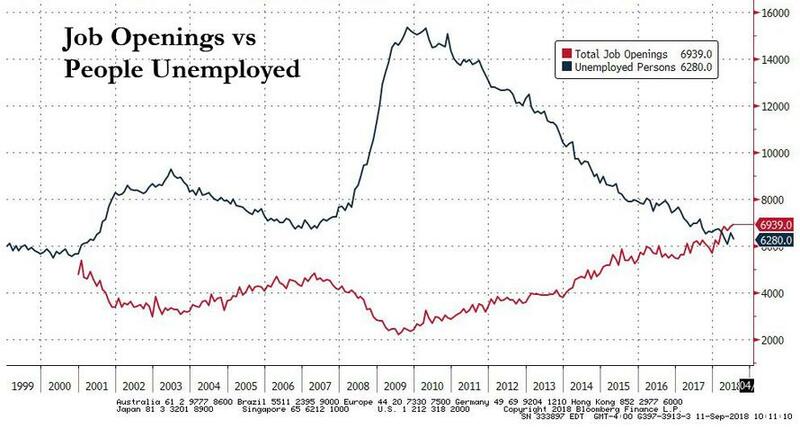 On one hand, with unemployment at a record low, there is an (alleged) overheating in the labor market, where there are now 1.1 job openings for every unemployed worker. Furthermore, amid a record number of workers quitting their jobs, bargaining power is starting to shift in the worker's favor as wages recently posted their highest increase since the financial crisis. As a result, employers are finally bidding up wages and offering more generous benefits to retain workers. On the other hand, as a result of the sad state of the US fiscal situation, profiled most recently by Goldman, employees are growing increasingly disenchanted about their long-term retirement benefits, while the chaos over the US healthcare system has prompted many workers to reconsider healthcare benefits as a key variable in job selection. Nowhere are these two trends more visible than in a recent worker survey conducted by Bank of America - in which the bank asked respondents what the top 3 factors they look for when considering a job - and which showed a distinct variation by the youngest, Millennial, generation compared to its predecessors. As one would expect, the survey revealed that pay/salary was at the top of the list across all respondents but what followed varied by generation and gender, with some surprising shifts. Baby Boomers reported preference for traditional benefits such as healthcare and retirement benefits. However, for Millennials and Generation X, it was less clear cut. 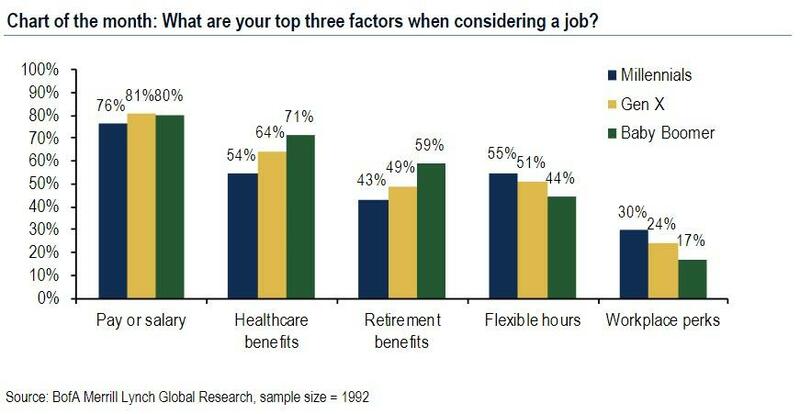 While traditional benefits still ranked high on their lists, younger workers reported greater importance of other non-monetary "lifestyle" benefits such as flexible hours and workplace perks (e.g. free meals/snacks, bring pets to work). Meanwhile, of all factors, Millennials put surprisingly low weight on retirement benefits while healthcare benefits was on par with flexible hours. 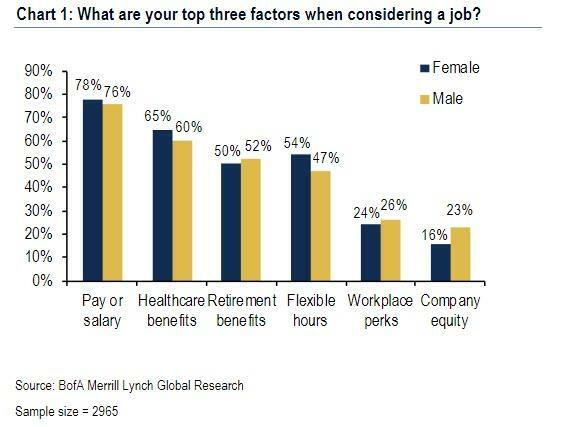 Broken by gender, the survey revealed that women placed greater importance to healthcare benefits and flexible hours while men put more emphasis on workplace perks and company equity. The results support the view that a shift in preference by younger generation for greater nonmonetary compensation is one of the many explanations for the slow pace of wage growth this cycle. The survey also asked respondents about their views on labor market conditions. Consistent with other consumer surveys, the US worker generally was feeling good about their job prospects. 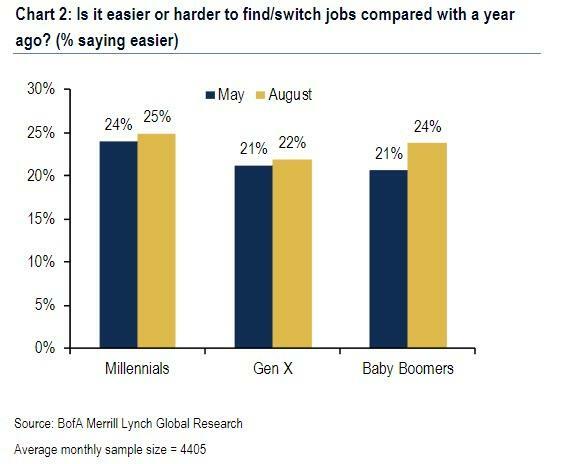 The share of respondents reporting it is easier to find or switch a job increased in August compared to when we asked in May with Baby Boomers showing the greatest improvement. However, roughly 1/3 of respondents reporting they have multiple paying jobs, suggesting that some workers may still be having a difficult time finding a full time job to meet their financial demands, explaining the "shadow slack" in the labor market. 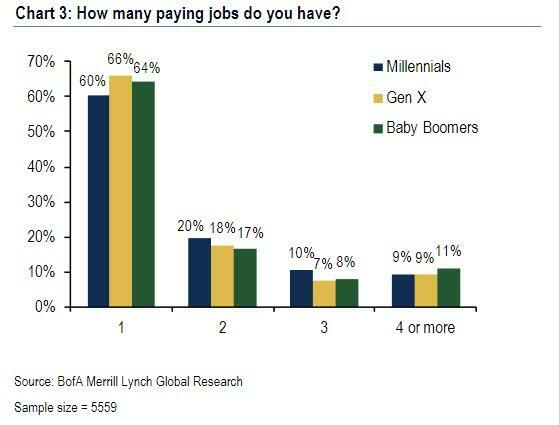 As one would expect, Millennials are more likely than their older counterparts to have multiple paying jobs. One explanation could be that Millennials are more likely to engage in gig economy which includes mostly part time jobs. Finally, the survey also looked at the breakdown of economic outlook by both geography and income. 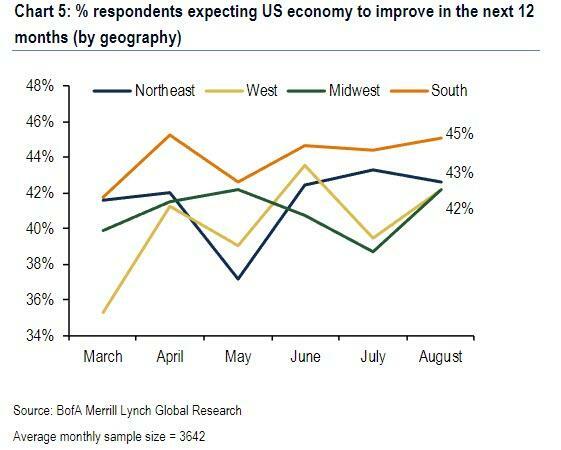 On the former, the outlook for the economy edged higher in the South since the survey was launched in March. Also, respondents from the the pro Trump-heavy South have consistently shown greater optimism than rest of the regions. In other regions confidence has ebbed and flowed but the plurality of respondents remains positive on the outlook with 43% of respondent in the Northeast and 42% of respondents in the West and Midwest expecting the economy to improve over the next 12 months. 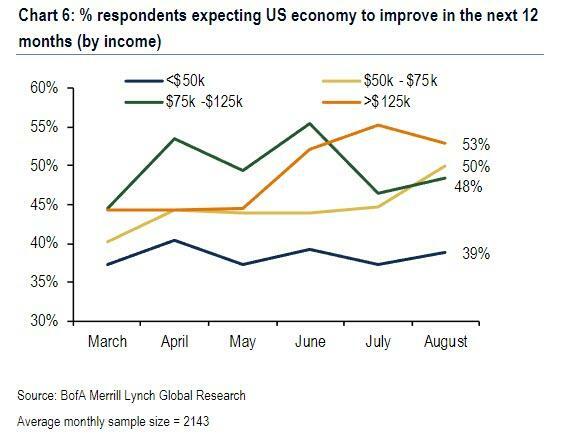 Meawnhile, when looking at economic optimism by income, BofA founds that the bottom income cohort, those with annual income lower than $50k, are and have been the least optimistic since the start of the survey with only 39% reporting in the latest reading that they expect the US economy to improve in the next year. Alternatively, optimism has improved for the top income and the $50k-$75k cohorts over the duration of the survey with 53% and 50%, respectively, reporting favorable expectations in the latest reading while responses from consumers reporting income of $75k-$125K has edged modestly lower to sideways.